The introduction of a new range of compact cars by Mercedes-Benz has proved a resounding success with its customers. The new B-Class, the dramatically different A-Class and the svelte CLA are all proving popular with existing enthusiasts of the three-pointed star brand, not to mention new conquests. Now the fourth member of the quartet has hit the road, and this one – the new GLA – comes with the added bonus of four-wheel-drive. The GLA is Mercedes’ answer to the Audi Q3 and BMW X1 but has more road presence than both. And even though it might be part of a line-up of so called compact vehicles it looks and feels like a bigger car – and that’s a big plus point. Look at it head on and you can see the strong resemblance to the A-Class, the car it’s based on, but that’s where the resemblance ends. Walk around the side and rear and everything is totally different, including the additional height of the GLA – it’s two inches higher and four inches longer than the A-Class – which affords the driver better all round vision. On the interior, however, there are a number of carry over features, including the instrument binnacle, the centre stack and most switches and buttons. And just like on the A-Class the GLA interior is a class act, with the black of the dashboard nicely broken up by the large brushed aluminium feature panel. But while most switches fall easily to hand I found the bottom row, which includes climate control buttons, difficult to read quickly when driving. High sports seats in leather with integrated headrests hold you firmly in place and are multi-adjustable and come with memory settings as part of an optional AMG exclusive package at £1,295. The black leather is stitched in red, dramatically improving its appearance. Entry level GLA models come with two-wheel-drive but my 220 CDI test car was equipped with full four-wheel-drive, capable of varying the amount of power going to front and rear axles depending upon need, and equipped with a switchable hill decent system. It uses a seven-speed dual clutch automatic gearbox with the shift lever on the column, freeing up floor space for items like cup holders and storage space. There’s generous space for front seat passengers and more than adequate room for those in the rear, given the car’s dimensions. With 480 litres of boot area the GLA provides ample luggage space for most families going on holiday and there is additional room under the boot floor for small items. With 170bhp on tap the 2.1-litre engine boasts plenty of pulling power and impressive mid-range flexibility, although I did find it noisy when cold. And there were a number of times when I used the manual gear change paddles behind the steering wheel to go from sixth to seventh as the auto box often seemed slow in making the move. Motorway work with the GLA is impressive and when you need that extra boost the kickdown is instant giving immediate response even at high speed. A switch on the dashboard allows you to change from eco mode to sport mode or manual as the mood takes you so there is plenty of variety to add interest to any journey. But best of all is the handling of the GLA. It’s tight, precise and almost sports car-like in its feel. 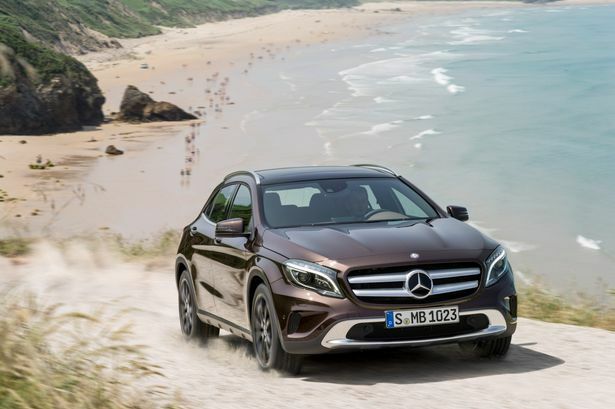 And with the four-wheel-drive giving you that added grip when you need it the GLA gives you what a lot of its competitors don’t – exciting, enjoyable motoring. Mechanical: 2,143cc, 170bhp, 4 cyl diesel engine driving all wheels via 7spd automatic gearbox.